Don’t waste entire weekends window cleaning. for our regularly scheduled window cleaning service. If just the thought of window cleaning leaves you disheartened or even frightened, call Squeegee Klean, residential window cleaning company, today. A chore that might take you days can be completed by our professional crew in two to three hours, depending upon the size of your home and the number of windows in it. 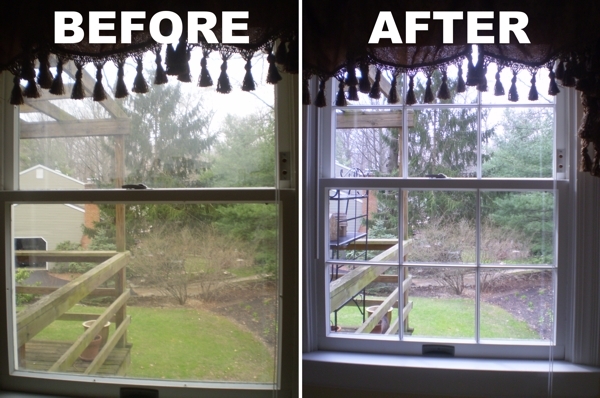 Although we do many different types of window-cleaning jobs, our residential window cleaning company work is our specialty; we have been providing this service to homeowners across the Susquehanna Valley and northern Maryland since 2004. We find residential window cleaning work especially satisfying due to the thanks we receive and the appreciation we earn from our valued customers, 75 percent of whom come to us as a result of referrals from other customers. We’re confident that once we’ve cleaned your windows, you will rave about how good they look to your friends, family and neighbors, too. We have experience window cleaning in all types of homes, including large estates, townhouses, older farmhouses, duplexes and city properties, all of which we service on a regular basis. We clean windows of all shapes, sizes and styles. No window cleaning job is too large or difficult for us to handle. From the moment we pull up to your home in our attractive vehicles, you will be glad you called Squeegee Klean residential window cleaning company for your window cleaning needs. All of our crewmembers are friendly, well groomed, and uniformed from head to toe. Plus, they are completely aware of your window cleaning job requirements. While many of our competitors send a different crew to your home each time you schedule a window cleaning, I come to every job site personally to make sure you get the service you expect. That’s because we’re not here just to clean your windows. We want to build a lasting relationship with you that you can count on year in and year out. Some of customers tell us our window cleaning technique is mesmerizing. We just think it’s the best window cleaning process in the industry. 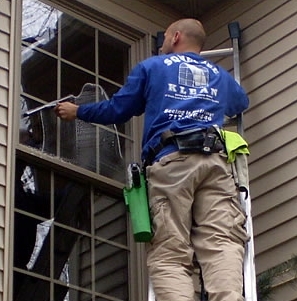 At Squeegee Klean, we use ladders – never poles – to reach your windows, so that we have complete control over the window cleaning process. And we never clean your windows using spray bottles or paper towels – we don’t expect you to pay for something you could do yourself. Instead, we use window cleaning mops known in the industry as strip washers, along with traditional squeegees. We carry our liquid cleaning solution in buckets attached to our belts, and use a precise, non-traditional cleaning technique that leaves all of your windows spotless and streak free. When we’re done cleaning the glass, we wipe down the window frames to remove any excess solution, and then finish each window by wiping clean the window well. I guarantee you will be 100% satisfied with your residential window cleaning experience. Throughout the entire process, you will feel comfortable with our crew in your home. You will not have to worry about following us around or watching over us. We are experienced, ethical service providers, dedicated to pleasing you. When we are inside your home, we will wear protective shoe coverings so you don’t have to worry about having your carpets soiled. While inside your home, we will be careful around draperies, furniture, and other important and valuable household items. Your windows will be sparkling clean when we leave. Many of our customers feel so comfortable with our presence in their homes that they leave the key under the mat for us. We are that trustworthy. The difference between our window cleaning work and our competitors’ work is, quite frankly, difficult to express in words. The quality of our work and the details of our window cleaning process must be experienced first-hand. Once you have seen our work, you will appreciate the difference between ordinary window cleaning and Squeegee Klean window cleaning. 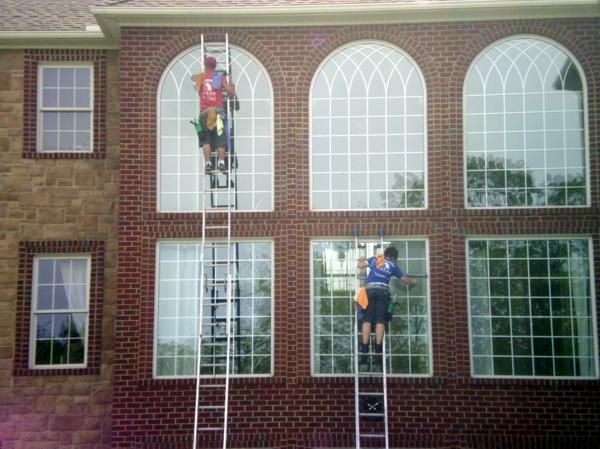 Why Get Your Window Professionally Cleaned? To enjoy a better view. To benefit from better heat efficiency. To have a brighter home. To free your time for activities that you enjoy. Glass allows natural light into your home, which helps cut down on energy costs. It also helps with the heating of your home during the winter months by allowing in and trapping heat from the sun. Unfortunately, glass delivers none of these benefits fully when it is dirty. Finally, if glass becomes damaged due to long exposure to contaminants, it must be replaced at considerable cost. How does window glass get damaged? Glass can, over time, become permeated with a variety of contaminants that compromise its transparency and performance. Glass is a porous liquid that continues to harden over time after it has cooled. Because it is porous, airborne pollutants can compromise its transparency. 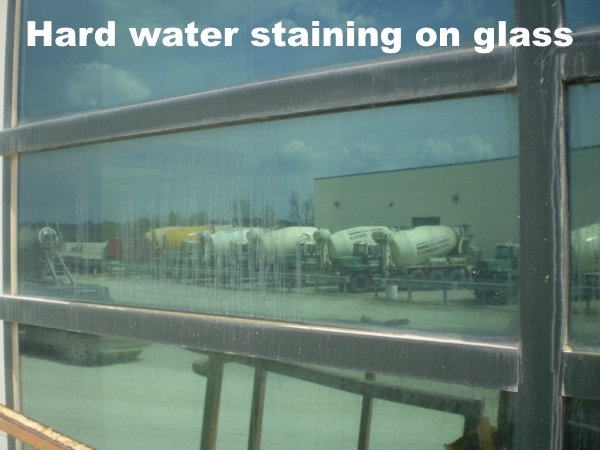 Hard water also can damage glass that is not cleaned on a regular basis. This can happen when rain water runs over man-made surfaces such as stained wood, painted siding or concrete sealant, collecting minerals and acids. These minerals and acids then accumulate in the pores of the glass. Glass that is not maintained over long periods of time can suffer permanent surface damage, and, ultimately, structural damage. Aluminum screens damaging your windows? Aluminum screens are common in homes that were built between 8-40 years ago. What most homeowners don’t realize is that aluminum oxidizes over time. 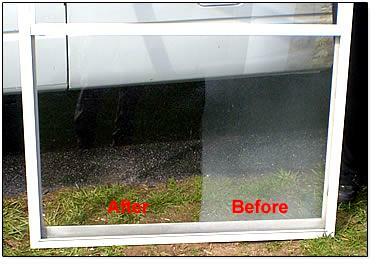 The oxidation from your screens and window frames will stain your glass. If this condition is corrected in the early stages of oxidation a traditional cleaning will in most cases take care of the problem. However if the problem is left unnoticed a special acid chemical may be needed to correct the problem. This process can be very timely and expensive but will restore the condition of your glass back to new. Removing the Oxidation: We begin the process, by applying a special acid chemical specially formulated to remove the oxidation from your glass. We then scrub your windows with a semi abrasive pad to ensure all the oxidation is removed. 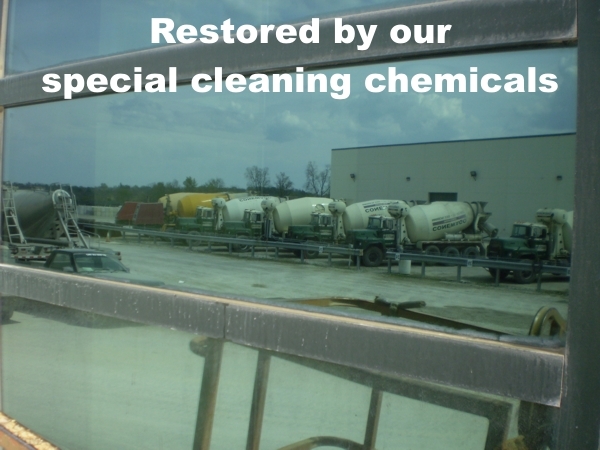 We complete the process by cleaning your windows our traditional way; leaving your glass restored to factory condition and clean. If you think this condition might be affecting your glass, call us today for a no cost, hassle free glass inspection. Screen cleaning is available upon request. Why just clean your windows when the screens are also dirty. Experience the best view possible and have your windows and screens cleaned. Please watch this video and let Heidi show you the in’s and out’s of cleaning your own windows. This was just the thing you needed to view to give you the motivation to either clean your own windows this weekend or call us immediately.